LA-610, Channel Strip from Universal Audio in the LA-610 series. Product replaced by the Universal Audio LA-610 MK II. 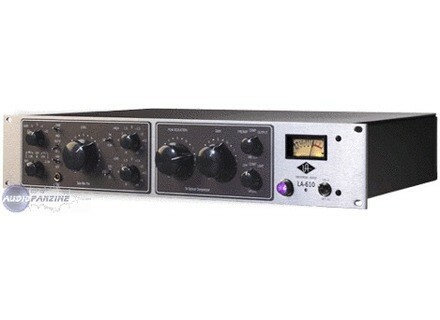 "nice channel strip, great quality"
The Universal Audio LA-610 channel strip is a modern interpretation of two classic, vintage tube designs, the legendary Bill Putnam designed 610 console pre-amp and EQ and the now ubiquitous LA2-A Compressor/Limiter. "Modern" is the key word here: while the design of this unit harkens back to the glory days of the 1960s, both in its retro looks and the 5 tubes it has under the hood, the LA-610 is surprisingly capable of achieving a variety of modern, brighter tones along with the myriad of harmonically rich and darker vintage tones that one would expect. Therefore, it should be noted that this unit is far more capable than just a boutique, color piece. While it's overall set of controls and connections may seem sparse, the LA-610 has a few distinct characteristics that set it apart from other rival channel strips. For example, the input selection knob on the front panel has four distinct impedance settings for microphones and high-impedance instruments. This means the LA-610 will play nicely with a variety of different microphones, along with both passive and active instruments. The other key feature is the line level input connection on the back panel. This allows anyone with an output from their soundcard to effectively re-amp audio from their DAW through the entire circuit path of the LA-610, utilizing the preamp section to add color and drive and the optical compressor section to add warmth and punch, along with additional harmonic distortion from the compressor's output gain. The ability to use the LA-610 as both a competent channel strip and a line-level conditioner is one of it's strongest attributes. The design at surface level is straight-forward and simple and any experienced audio technician or home studio owner could likely just dive-in. However, the controls do have an unorthodox configuration that will take some experimentation to fully grasp the concept. The large Level and Output knobs are the most prominent controls on the front of the unit. This leads one to believe that 'Level' is the input gain and 'Output' is the output gain. However, this is a misnomer, because these controls exist on separate circuits. The 'Level' knob is in fact the output gain for the pre-amp section and the 'Output' knob is the output, or make-up gain circuit for the compressor. This becomes problematic, because upon first use when trying to achieve a clean signal, one initially turns up the 'Output' knob thinking they are turning up the output of the pre-amp and then in turn, lowers the 'Level' knob as low as possible, thinking they are keeping the pre-amp input gain low to avoid distortion. In reality, what has happened is that the user has turned the output gain of the pre-amp way too low and then in-turn is distorting the weak-signal by having the make-up gain of the compressor turned up too high. The result is a dark, muddy signal that will leave first-time users puzzled as to what the vintage appeal is really all about! This is where reading the manual is very important, as it explains the controls adequately! The input-gain for the pre-amp is in-fact the small, disproportionate knob in the top-left corner of the faceplate. It is referred to as the "Coarse Gain Adjustment", meaning that the input gain is set to a fixed power curve whose overall level is adjustable in steps of + or - 5 decibels. Therefore, set at -10 and -5, the pre-amp is at it's cleanest, most transparent state. Likewise, the 0, +5 and +10 settings add in more tube saturation ranging from light vintage coloration to rich overdrive depending on the source signal. Therefore, in practice, the best approach to setting up the LA-610 would be to turn the large "Level" knob all the way to 10 and then adjust the coarse gain knob in increments until an adequate level is achieved. Then you can back the level control down ever so carefully until you achieve the desired levels in your DAW. Understanding how the input and output gain structures work on the pre-amp side of the unit, one can then make better use of the compressor/limiter side. While the LA2 side won't be a formidable replacement for the real LA2-A, it is fully capable of delivering that signature, smooth sound and rich tone that the LA2-A stand-alone unit is known for, particularly for bass and vocals. It is also important to note, that it is an essential element of the channel strip's overall design! While, the photo-optical cell used in the LA2 design to compress audio is revered for it's smooth, rich sound quality, it's also notorious for making the source signal much darker. Therefore, the preamp circuit has been modified from its original vintage design to be a bit brighter in order to compensate for this darkening effect. Therefore, a few dBs of gain reduction and a little bit of the make-up gain can go along way to evening out the tone of the unit as a whole, espeically if you find the pre-amp to be initially a bit bright or sibilant on its own. The compressor is also very easy to use, simply turn the Gain Reduction knob and follow the VU Meter. Like the original LA2-A, or with most LA2-A plugins, you will similarly find that the output, or make-up gain circuit can add a lot of color and drive. This could be particularly useful if you run your LA-610 into a mixing desk first and have a fader to control the ultimate level that reaches your DAW. The only feature untouched here would be the EQ controls. Oddly at first, the EQ section comes before the compressor. This is because the EQ controls paired with the 610 pre-amp mirror the same design pairing found on the original 610 console from which it was based. The eq consists of a high and a low shelf filter. Along with the impedance settings, these controls are particularly helpful in this first position in adapting the LA-610 to different microphones or instruments. For example, a modern condenser microphone that may appear too bright at first may be thickened up with the low end and have some of the highs rolled off. Likewise, a vintage microphone or line level signal can be brightened up to compensate the effect of the compressor. Additional warmth can be added to the low end of electric pianos and basses and some of the harsh top-end can be rolled off of electric guitars and guitar amp cabinets. This unit is often found in professional studios purely for tracking DI Bass. Because of the inherent tube saturation of it's design, effective EQ controls and signature optical compressor tone, the LA-610 is a world-class unit for DI Bass. From a warm vintage tone with moderate coarse gain settings and subtle compression, to radical gain settings that induce rich overdrive, the LA-610 can cover a lot of ground. If you can't achieve a solid bass tone with this unit, then you haven't set it up right. The other most common application for the LA-610 is for vocals. For many studio owners, this would be the tube-powered foil to their pristine, solid state pre-amps. With low coarse gain settings and moderate compression, the unit delivers surprisingly clean and transparent tones, especially when paired with an equally transparent condenser microphone. It even works perfectly for voice-overs, providing a warm, slightly colored tone with plenty of clarity. Upping the coarse gain setting, the harmonic distortion becomes more apparent, inducing a vintage vibe to vocals. With even more coarse gain and compression, you can achieve Motown like distortion and overdrive to pure destruction depending on the source and microphone. In conjunction with the eq and compressor settings, the saturation on hand with this unit can be very useful for beefing up thinner vocal tones. Pushed to its limits, it easily overdrives, but does so in a musical way. While the LA-610 will surprise in it's versatility for recording vocals, a few notes should be made here about microphone pairings and the amount of available gain. This is not a Neve 1073 or comparable Great River pre, it will not deliver heaps of scorching gain. This is a vintage tube unit that easily, but musically overdrives at its limits. It should have more than enough clean gain for most condenser microphones. However, if you are like me and you want to pair a ribbon or a dynamic microphone with it, I highly recommend purchasing a Cloudlifter. In fact, I consider it indispensable when using an SM7b. Likewise, many people often comment on this unit that it doesn't suit one microphone or another. While the LA-610 is far from a Swiss-army knife in terms of versatility, if you spend time playing with the impedance settings and the EQ, you will find that it adapts to most scenarios surprisingly well. The LA-610 can work nicely as a pre-amp for Cabinet mics. For example, if you are using a punchier, solid-state pre-amp powering a dynamic mic on one part of the speaker, you could provide an alternate, airier tone with a condenser mic powered by the LA-610. Using the different controls to color the signal to taste, one can get some interesting tones to pair with their standard on-axis SM57 approach. Likewise, powering a dynamic like the SM57 through the LA-610 can help add warmth and at times extra saturation to amp recordings. However, what I have found the LA-610 to truly excel at with guitars is a front-end for DI recording and Amp Simulators. Amp simulators and their effectiveness are much debated, but it's certain that an amp simulator is only as good as the pre-amp you play through. The tube design of the LA-610 feels and responds to an electric guitar with the same sensation and picking dynamics as a standard Tube guitar amp. It's saturation does a wonderful job of adding organic color to your DI tone before it hits your DAW and eliminates a lot of the hiss and high-end unpleasantness that even the best amp simulators are prone to. Furthermore, it responds very well to effects pedals! Guitar effects pedals, particularly higher-end and boutique pedals, are designed to be used in front of tube amps. So, their sonic characteristics interact more naturally with the tube-powered LA-610 verses the HI-Z input on your soundcard. Being able to add rich overdrive tones into your favorite amp sim via the LA-610 is major coup for the small studio owner who doesn't own a fleet of vintage tube amps, much less a sound-proof space to use them. Another quick note on using the LA-610 with guitars is its effectiveness as a volume booster. Think of it as a rack-mounted tube treble booster with built-in optical compressor! All you need is a re-amp pedal so the line output from the unit can feed into your regular signal chain of effects pedals on it's way to the input on your amp. This area I don't have much experience with the LA-610, as I primarily work with midi synths and keys. However, the lower of the high-impedance DI settings is designated for Active keyboards, basses and guitars and I imagine would be very effective in this area. While experimenting for a soundtrack project recently, I ran a multitude of signals from my iPad into the 47 k impedance setting with great results. From adding saturation to GarageBand app strings to adding analog depth to the Animoog and Korg iMS-20 apps, the organic quality that was added by the LA-610 was very noticeable and appreciated. The Line-level input on the LA-610 really opens this unit up for experimentation in the studio. When re-mixing other people's projects, the ability to re-amp signals and add in harmonic content and saturation to previously dull sounds is indispensable. Likewise, it's a perfect unit for slamming drum samples, both for effect and for parallel compression/distortion. This same technique applies for vocals. A mono print of the lead vocal bus, distorted and heavily compressed, can be mixed to great effect back in under the dry tracks. In fact, this approach can be applied to anything in the mix that needs a touch of character and attitude. Ultimately, the LA-610 is a top-class unit worthy of its place in any professional studio. It's not the most versatile of channel strips available, but it will accomplish more than you think. While its weak points may be discouraging for some, it should be noted that it performs its strengths better than most units in this price range. It won't replace or perform all of the functions of a stand-alone LA2-A, but the combination of the 610 pre-amp and the reduced format LA2 compressor side provide a character-full, superb sound quality at an accessible price point for project studios and professionals alike. Ideally, having one cleaner, solid-state pre-amp would be good to have in the rack next to the LA-610, but if you're looking for a front-end to your favorite DAW capable of delivering a wealth of organic, analog tone to any signal source, than I highly recommend the LA-610. +While not inexpensive by most project-studio standards, being able to obtain this pre-amp/compressor combination on the used market for under $1000 is remarkable. +Variety of Impedance settings for matching a myriad of different microphones and instruments to the unit. +Line input and reamping capabilities open up this unit's vintage tone to a world of modern experimentation. +A perfect front-end for recording guitars. It's ability to respond to guitar effects pedals and greatly improve the sound quality of amp sims is a major consideration for the project studio owner. +If there is one thing no professional will argue, it's that this unit is world class for recording bass. +The rack appeal of it's vintage design is an immediate statement of intent in any studio. -For a unit that will attract most people for it's use as a saturation-inducing tone-box, the limited ability to control the input gain on the pre-amp section is disappointing. If this is your sole concern and the compressor side of the unit isn't of great interest to you, then you should consider the stand-alone 610 Solo from UA. It has fully-featured Gain and Output Level knobs for dialing in the precise amount of saturation, along with the same EQ and Impedance controls. -VU Meter: While it's accurate, it is quite small. It has since been made larger on the MKII version of this unit. -No true bypass for the compressor section. The bypass switch is a misnomer, as the gain element is still active and only the photo-optical cell is disengaged. -Likewise, no bypass for the pre-amp in order to re-amp sounds directly to the compressor side. However, setting the pre-amp section so the signal passes to the compressor as transparent as possible certainly wouldn't detract from the source signal. -Only XLR inputs and outputs for line-level signals, no balanced input jacks. Will require a balanced jack-to-XLR cable for those whose soundcards do not have XLR outputs.